Torrey Pines State Park. Photo courtesy Wikimedia Commons. A portion of a major thoroughfare in La Jolla will be closed next week for construction work on a ramp in Torrey Pines State Beach that was damaged by the winter storms. Crews will make emergency repairs to the pedestrian access ramp that was undermined by storms in January, according to city officials. The work will require the closure of the southbound lane of North Torrey Pines Road between 9 a.m. and 4 p.m. Monday through Thursday of next week. “The closure will allow crews from the City of San Diego to safely use the heavy equipment necessary to complete the repairs before the summer beach moratorium begins on Memorial Day,” spokesman Anthony Santacroce said. 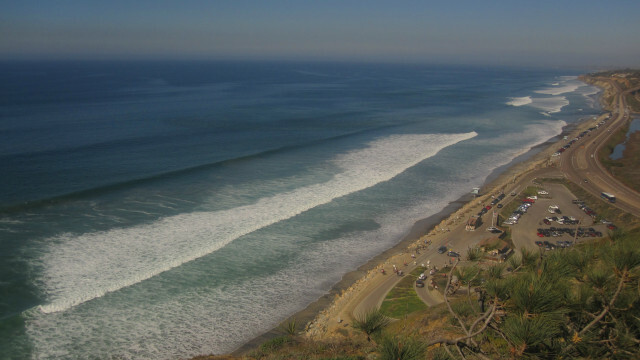 The road will also be passable for bicyclists and access to the beach will remain open from the Torrey Pines State Beach parking area and from the parking area at the southern end of the beach. All motor vehicles, including buses, will be required to follow detour routes on Del Mar Heights Road and Carmel Valley Road during work hours, according to Santacroce.